I seriously have no eye definition … absolutely none! This fact is also not helped by the fact that my eyelashes are quite fair (and thin) – so without makeup my eyes jut blend into my face. As much as this has always bothered me, it only occurred to me a few years back that I need to wear eyeliner everyday. For some reason until then I had only used eyeliner for evening makeup. Such a simple solution should be simple – but unfortunately eyeliner application has never been one of my strengths. It doesn’t matter how hard I try I have never been able to get either a straight or consistent line, and I’ve always ended up looking more ‘Priscilla Queen of the Desert’ than chic and classy. My daytime application needed some work! So I tried pencil – but that was also not great. While my eyelids are not sagging on to my cheeks (yet! ), the thinning that comes with ‘middle age’ means they are loose enough that pencil pulled and dragged my eyelid skin – leaving little ‘tucks’ – not a good look! I had nearly given up, but then by chance discovered Australis Stayput Long-Lasting Eyeliner at my local Kmart. 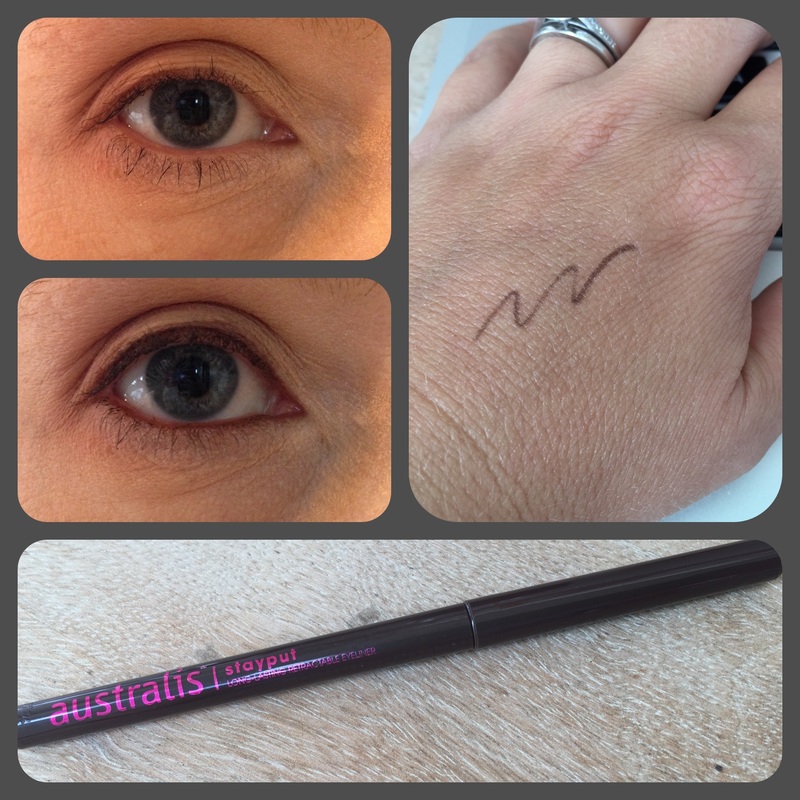 It comes in a handy twist-up pen (no sharpening required) and like all Australis products is cruelty free. It is also made of a soft crayon-like formula that is super easy to apply. I’m the first to admit that I’m still not great at putting on eyeliner, but with at least with this I can easily apply a very thin (day time appropriate) line close to my eye lashes. This is now my everyday eyeliner – I love it! Top eye – without eyeliner. Bottom eye – with eyeliner. Australis Stayput Eyeliner is $10.45 and available in four colours. I have both black (for evening) and chocolate (for daytime).